I think these are unique and fun! 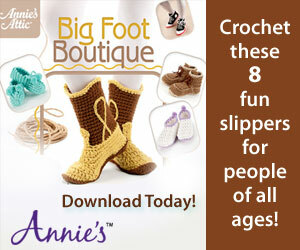 I live either in my flip flops or barefoot all summer long, these are great! Capelets are a nice and stylish way to keep warm on a cool spring day! I could see myself using this as a skirt as well! RED HEART® “Super Saver®”, Art. 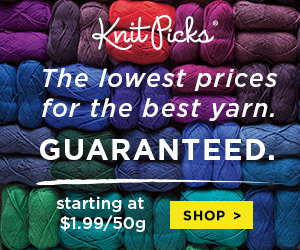 E300 (6 ounce/348 yard skein): 7 (9) Ounces No. 305 Aspen Print CB. 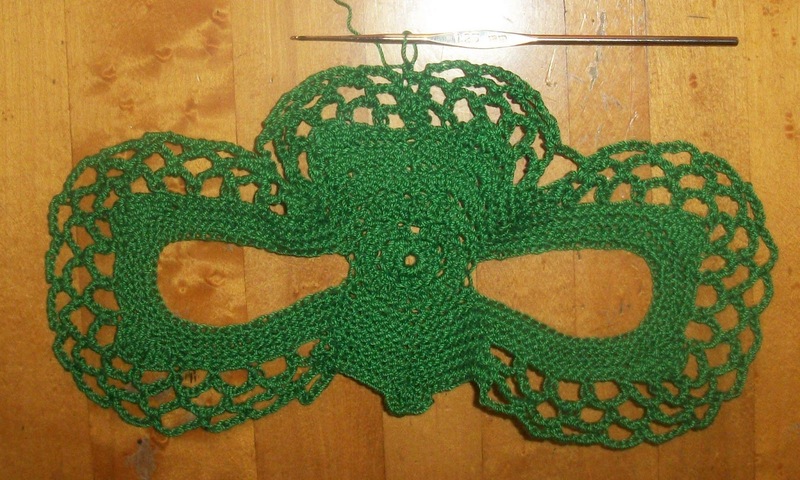 From time to time I find a cute baby pattern! I love this shirt, sometimes simple is beautiful! 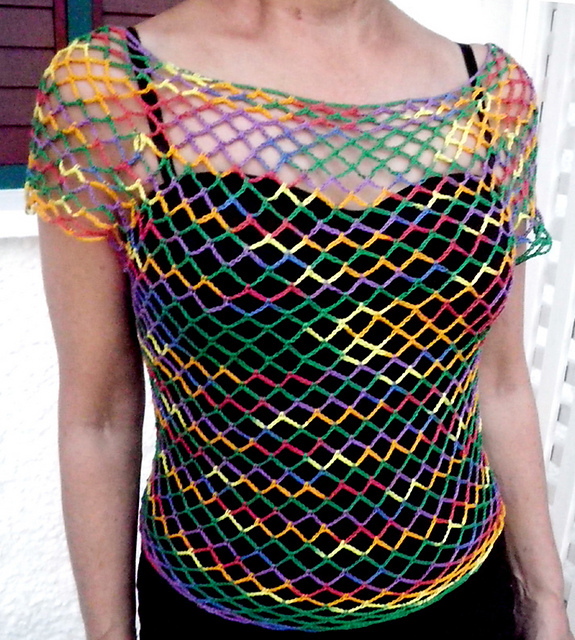 I like that it has short sleeves and can be a great summer time wear! Materials: Bernat Baby Coordinates and a G hook. Size: Newborn/preemie instructions. 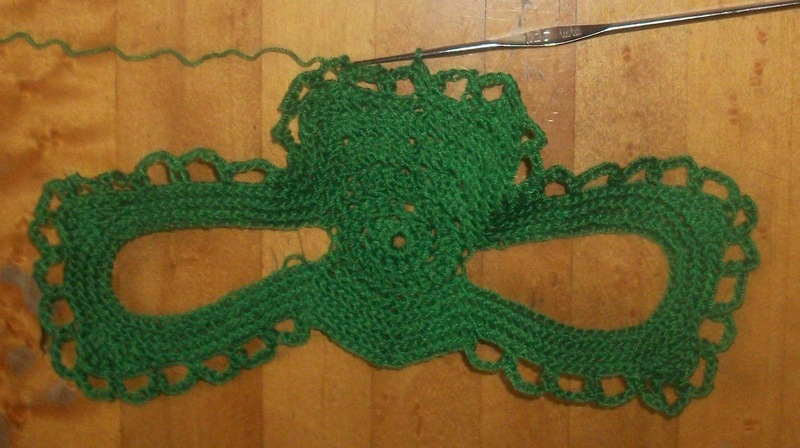 Changes in yarn and hook size will affect finished size. Increasing/decreasing the starting chain by 4 will also give you infinite sizing options. I a still dreaming of spring, flowers, green grass, barefoot, and dresses! 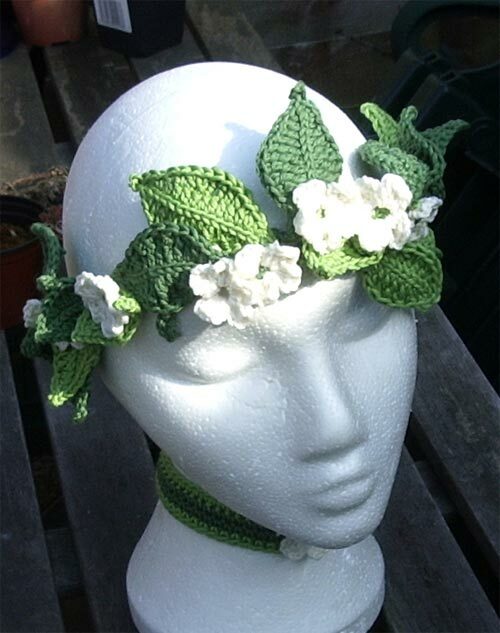 Here's a lovely headband/ headpiece for the season! This is very clever! Super Mario played a big role in my youth, here's a great way to bring him back! 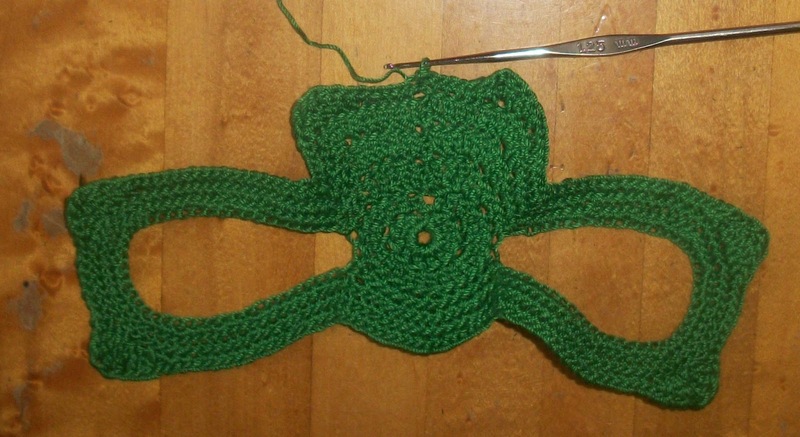 This pattern is very easy, all you need to know is how to make a granny square. 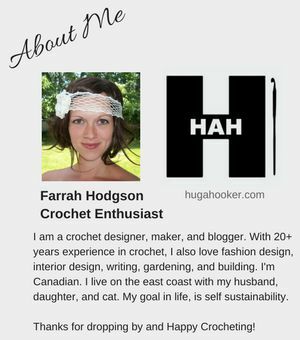 I am loving crochet jewelry more every day! 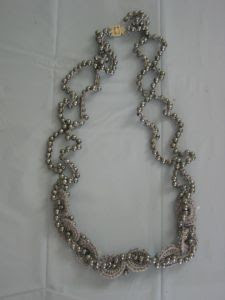 Materials: Size 5 DMC Pearl Cotton (27 yd skein) in Gray (318), 270 size 5mm Pearl-Gray beads, O hook, necklace clasp and large eye beading needle. A pretty hat for the spring! Supplies: RED HEART® "Fiesta®": 1 Skein 6013 Wheat. Size: Hat fits most women. Here's a really easy skirt pattern. 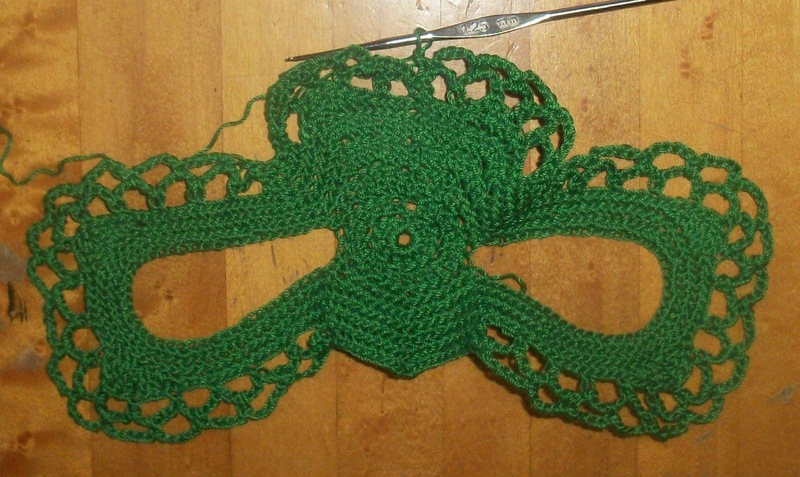 It is basically just four large granny squares joined together with ties. This would look great as a summer skirt, or worn over pants as an apron skirt! I must admit, I usually hate working with these weird specialty yarns! 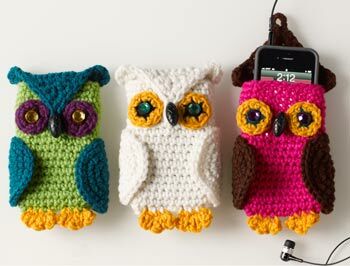 I could never think of anything to make with it besides a scarf, but finally, I found something oh so cute! 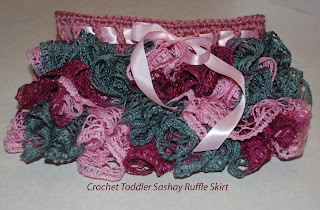 This is an adorable skirt for a child, it looks like a tutu. My little one would love this! This is beyond cute! 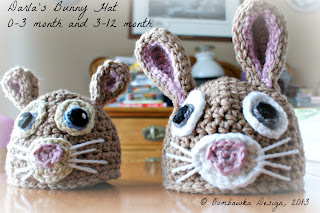 A great idea for Easter, or just for any day wear, a child will always love this! I am having a hard time choosing between crochet bag patterns for myself, here is another contender! Supplies: RED HEART® “Super Saver®”: 2 Skeins 0319 Cherry Red A and 1 skein 0311 White B.
Yarn needle, one 1” button. Size: Tote measures 10" x 12". 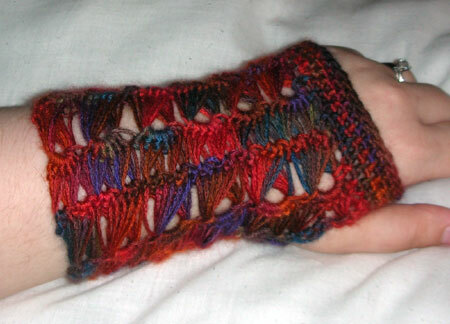 A nice lightweight wrister pattern for spring! These are super fun! 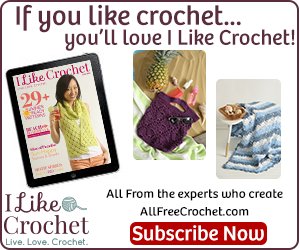 You could also sew many of these squares together to create a fun afghan! 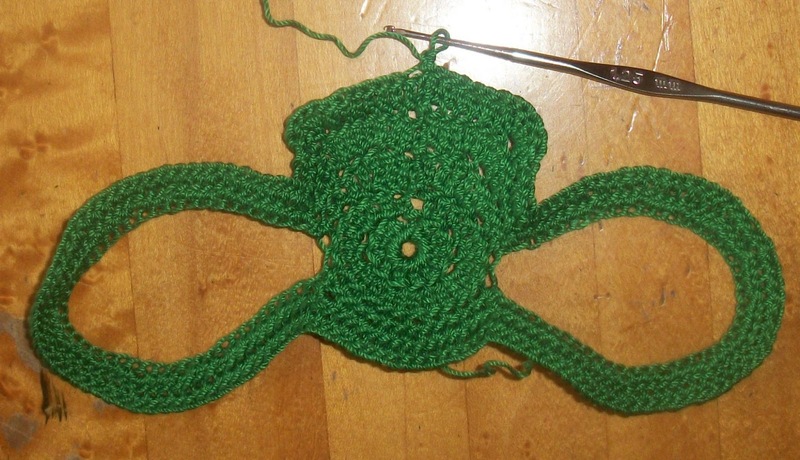 Hook: To match yarn size. This collar is not only super cool, but pretty easy too! Supplies: REDHEART® “Soft Yarn”: 1 Ball 9388 Wheat. Feather Trim on Bias Tape, 26 (29, 32)” long, 250 (280, 310) bronze seed beads, 45 red seed beads, beading thread, small beading needle, yarn needle. Finished Length: 28 (31, 34)”, without ties. Here's a cute cell phone case pattern for you! Everybody loves owls. Colorway #1: Spring Green, Real Teal, Gold, Coffee, Dark Orchid. Susan Bates® Crochet Hook: 6mm [US J-10]. 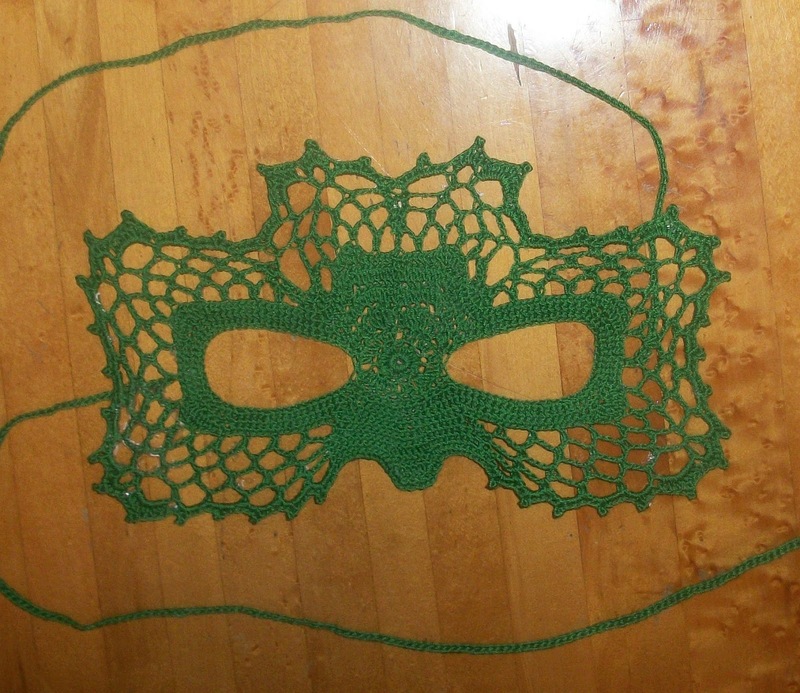 Finished Measurements: approximately 4½ x 6¼ inches [11⅜ x 15⅞ cm]. 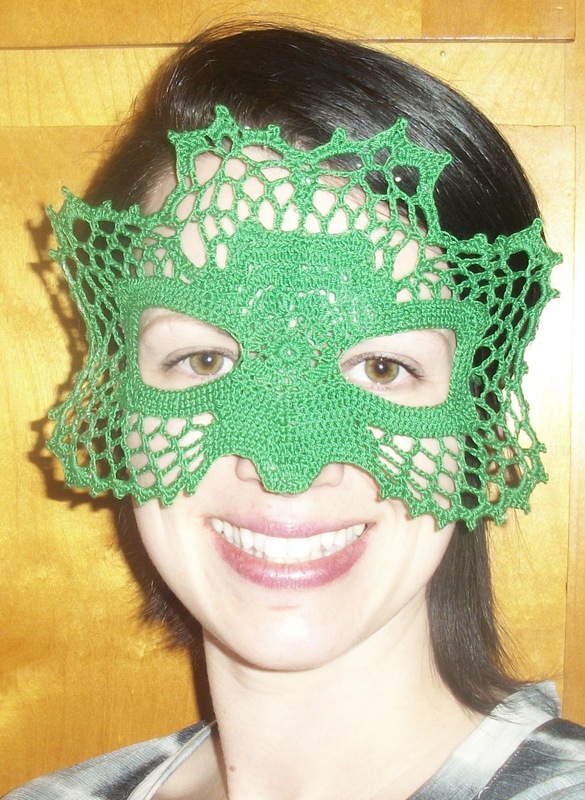 Give your lace crochet skills a test with this pretty shamrock mask pattern! Please do not copy, nor distribute my pattern without consent. 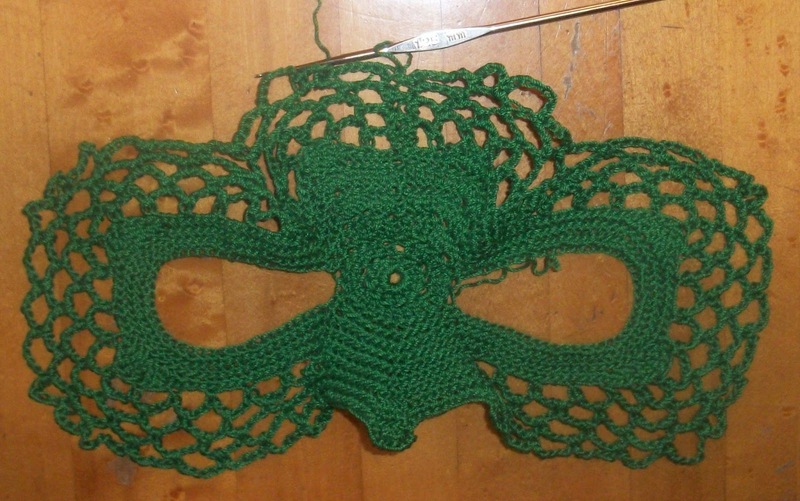 You may make and sell the finished product:) Copyright 365 Crochet, 2013. Do not turn in this pattern. Ch6, sl st in 1st ch to form a loop. Rnd 1: 12dc inside ch6 loop. Sl st in 1st dc. Ch3. Rnd 2: Dc in 1st st, 2dc in next 11 sts, sl st to top of ch3, ch3. Rnd 3: (dc-tr) in 1st st, (tr-dc) in next st, dc in next st, 2hdc in next st, sc in next 2 sts, ch45 (eye opening); sc in next 5 sts, 2sc in next 2 sts, sc in next 5 sts; ch45 (eye opening), sc in next 2 sts, 2hdc in next st, dc in next st, (dc-tr) in next st, (tr-dc) in next st, sl st in 1st dc, ch3. Rnd 4: Dc in next 2 sts, 3dc in next 2 sts, 2hdc in next st, sc in next 3 sts, skip next st, sc in next 6 chs, (2sc in next ch, sc in next 2 chs) 10 times, 2sc in next ch, sc in next 8 chs, skip next sc; (2sc in next st, sc in next 2 sts) 4 times; skip next sc; sc in next 8 chs, (2sc in next ch, sc in next 2 chs) 10 times, 2sc in next st. sc in last 6 chs, skip next st, sc in next 3 sts, 2hdc in next st, 3dc in next 2 sts, dc in next 2 sts, sl st in 1st dc, ch3. Rnd 5: Dc in next 6 sts, 5dc in next st, hdc in next st, sc in next 4 sts, skip next st; sc around next 128 sts; skip next st, sc in next 4 sts, hdc in next st, 5dc in next st, dc in last 6 sts, sl st in 1st dc, ch1. skip next st, sc2tog, sc in next 15 sts, 2sc in next st, 2hdc in next st, 2dc in next st, 3tr in next st, dc in next st, hdc in next st, sc in next 8 sts, hdc in next st, dc in next st, 3tr in next st, 2dc in next st, 2hdc in next st, 2sc in next st, sc in next 15 sts, sc2tog, skip next st, sc in next 7 sts, 2hdc in next st, dc in next st, (dc-tr-dc) in next st, hdc in next 2 sts, sc in last 5 sts, sl st in 1st sc. sc2tog, sc in next st; (ch5- skip next 3 sts, sc in next st) 5 times, ch5- skip next 1 st, sc in next st, ch5- skip next 2 sts, sc in next st, (ch5- skip next 3 sts, sc in next st) twice, ch5- skip next 2 sts, sc in next st, ch5- skip next 1 st, sc in next st, (ch5- skip next 3 sts, sc in next st) 5 times, (sc2tog) twice, sc in next 2 sts, ch5- skip next 3 sts, sc in next st, (ch5- skip next 1 st, sc in next st) twice, ch5- skip next 3 sts, sc in next st, ch5- skip next 3 sts, sl st in ch1 of beg ch5, ch1. sc2tog, sc in next st, sc in next ch5 sp, (ch5, sc in next ch5 sp) 14 times, ch1- sc in next ch5 sp, sc in next st, (sc2tog) twice, sl st in next 2 chs of next ch5 sp, sc in same ch5 sp, (ch5, sc in next ch5 sp) 4 times, sl st in 1st sc, ch1. (ch5, sc in next ch5 sp) 14 times, sc in ch1 sp, ch3, skip over sc and sl sts; sc in next ch5 sp, (ch5, sc in next ch5 sp) 3 times, sl st in 1st sc, ch1. (ch5, sc in next ch5 sp) 5 times, (ch7-sc, ch5-sc) in next ch5 sp, (ch5, sc in next ch5 sp) 4 times, (ch5-sc, ch5-sc_ in next ch5 sp, ch7, sc in next ch5 sp, (ch5, sc in next ch5 sp) twice, ch3, sc in ch3 sp, ch5, sc in next ch5 sp, (ch7-sc, ch5-sc) in next ch5 sp, ch7, sc in last ch5 sp, sl st in 1st sc, ch1. (3sc-picot-2sc_ in ch5 sp - 5 times, (4dc-picot-3dc) in ch7 sp, (3hdc-picot-2hdc_ in ch5 sp, (3sc-picot-2sc) in ch5 sp - 5 times, (3hdc-picot-2hdc) in ch5 sp, (4dc-picot-3dc) in ch7 sp, (3sc-picot-2sc) in ch5 sp - twice, 3sc in ch3 sp, 5sc in ch5 sp, (4dc-picot-3dc) in ch7 sp, (3hdc-picot-2hdc) in ch5 sp, (4sc-picot-3sc) in last ch7 sp. Starch mask. Place spoon under nose for definition. 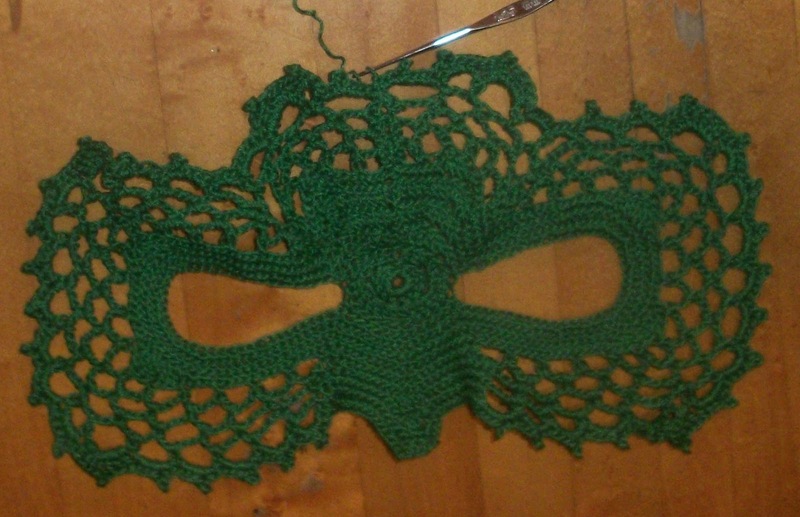 Add ties, lace, or elastic. 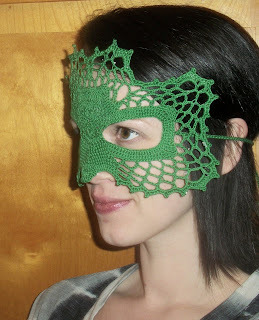 Wear it and drink green beer! Check out my other Masquerade Mask Crochet Patterns!